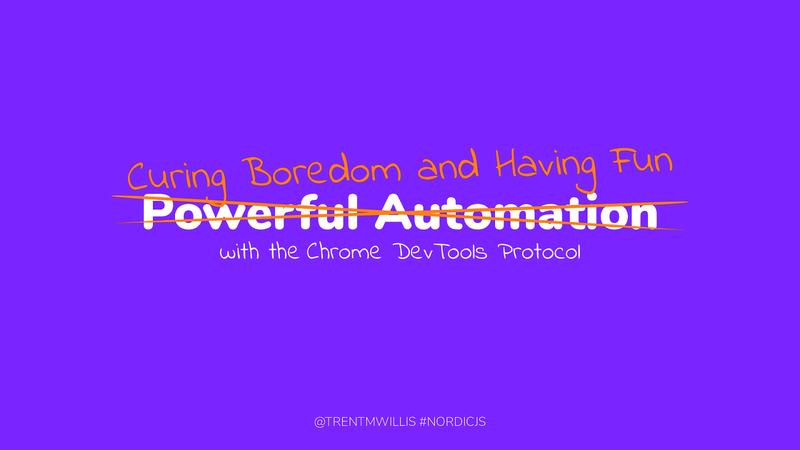 View Powerful Automation with the Chrome DevTools Protocol on Notist. In this talk, we’ll look at how you can start using the Chrome DevTools Protocol today to unlock powerful automation techniques for your web application. We’ll cover how to start using the protocol through Puppeteer and then dive into some of the really exciting possibilities that have opened up when using this in conjunction with headless browsers, such as holistic end-to-end testing, the collection of code usage metrics, and new service paradigms. Trent puts presentations on for free. You can too. Thanks for a really interesting talk! Looking forward to explore more of puppeteer. Awesome talk Trent! 🔥 Looking forward to the recording/slides. Thanks for your talk. I am motivated to find usecases just to play around with puppeteer.